A new version of SketchBook Pro, the “artistic toolkit” application for the Mac, has made its debut on the Mac App Store, offering an interface overhaul and cloud support among other features. 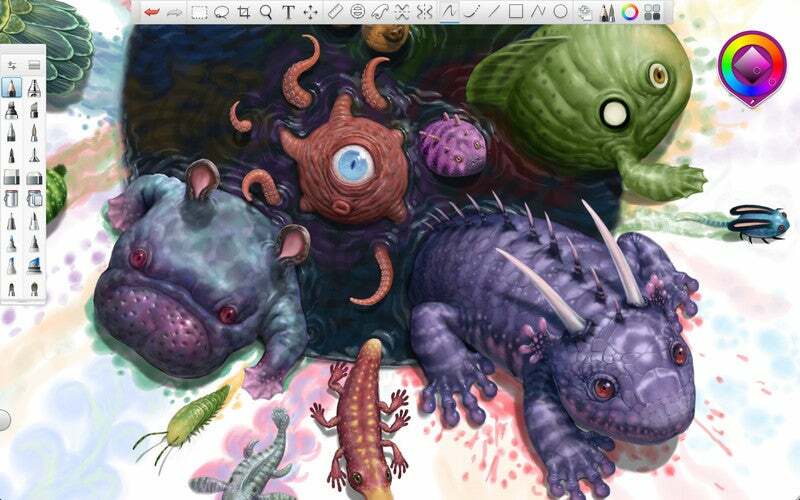 SketchBook Pro 6.0 offers new editing and layering options. Version 6.0 of SketchBook Pro promises a streamlined interface. Multi-touch navigation in the application is aimed at keeping artists immersed in the creative process, developer Autodesk says, while new guide tools such as French curves should help create more precise strokes in the app. The updated application boasts more than 100 preset tools in its brush library. SketchBook also includes synthetic paint brushes and smudge brushes to allow for more color blending. Other features in the new version include the ability to adjust the brightness, contrast, hue, saturation, color balance, and grayscale—and also the option to invert the image. The app was designed for Mountain Lion, Apple's recently released version of OS X, though it will run on Macs using OS X 10.6.6 or later. SketchBook Pro 6 includes support for Documents in the Cloud so that artists can save their files directly to iCloud. This lets them access canvases from the iOS versions of SketchBook, or any other computers of theirs with SketchBook Pro 6 installed. If you’ve got a MacBook Pro with Retina Display, SketchBook Pro has been updated to take advantage of that higher-resolution screen. The program’s App Store description additionally says that it’s specially designed to take advantage of pen tablets, including Wacom’s Bamboo, Intuos, and Cintq offerings. Users of SketchBook Pro 5.0 and later won’t be able to upgrade for free: Autodesk considers this a new version of its application. Version 6 is currently available for $30—that’s an introductory price, the company told Macworld. The latest version of SketchBook Pro is making its debut exclusively on the Mac App Store. Autodesk says that the application will be available on other platforms within the next few days.